Ermanno Sport ski rental is located next to “Gressoney Monte Rosa Ski School” and “Monterosa Ski Area ticket office”, right at the Gressoney La Trinité lift stationé. Where the mountains rise bridge between the Valle d’Aosta and Piedmont are situated the village of Gressoney and the Monterosa Ski: 180 km of artfully prepared routes served by technologically advanced facilities and surrounded by the paradise of freeride, a wide area accessible using the facilities or by helicopter. Take the A5 motorway, if coming from Turin, or the A4 motorway, if coming from Milan, in the direction of Aosta. Exit at Pont-Saint-Martin and take the Regional Road SS 26 to Lys Valley until you reach Staffal, 9 km upstream from Gressoney Saint Jean and 5 km upstream from Gressoney La Trinité. 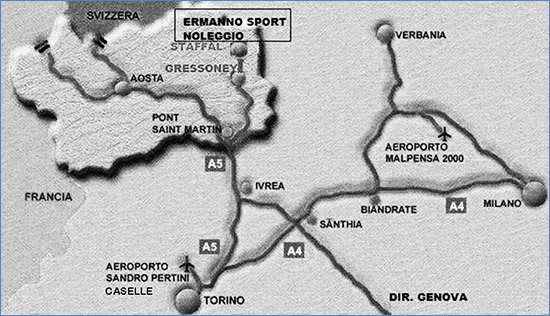 Ermanno Sport store is located next to the ski school and the ticket office, in front of the parking, on the right bank of the river.